Thank you once more to all the good friends and great artists who helped fill in for me over the last couple of weeks. You guys are AWESOME. 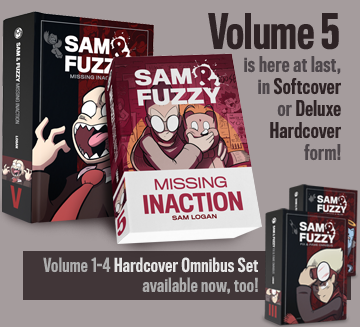 Today we have the first part of a six part story ominously (and misleadingly) titled "Whatever Happened to Sam and Fuzzy." This is the spiritual successor to all those long-form Christmas specials that I've done every year. I figured no one would realize that unless I came right out and said it, since A) it isn't Christmastime, and B) the comics have been so long lately anyhow. But other than that, it's exactly the same! And it continues on Wednesday, so tune back in then. The second guest strip comes from my buddy Jason Sigala, who just recently wrapped up work on the much-missed Niego. Oh, why must the good always die with an archive of less than 150? But Jason is still getting his cartooning on, in the form of a new autobiographical comic called The Fathead. It's only started very recently, so I don't really have a good feel for it yet, but I'm eager to see where it goes. There may be a final bonus guest strip running on Saturday, and there may not be! 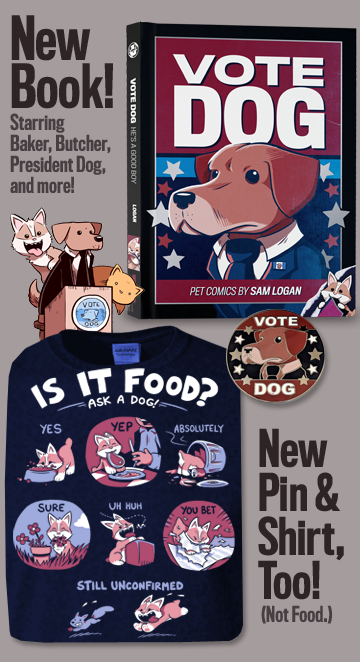 Either way, my own comics will be returning to the site on Monday. See you then! In keeping with what passes for tradition around here... I'm wearing an oven mit on my head and soaking my feet in gatorade. And also, we're kicking off the final friday of O-GAWD just as we have in the past: with a double dose of guest comic action. The first comic is from Kristopher Straub... the mastermind behind my other favourite new webcomic of 2005, Starslip Crisis. But it's his other webcomic, Checkerboard Nightmare, that introduced the world to the prize-winning asses (both of them) in the fourth panel of his guest strip. I think Kris has successfully identified the subconcious reason why I liked CN so much, and why I always assumed a large chunk of my readers would dig it too. Look, I'm even providing you with links to my two favourite storylines!